Imagine a world where lamp posts double as 911 operators and solar-powered trash cans compact waste on city streets. Where public park benches serve as phone-charging stations and robots go to school on behalf of ailing children. It’s an urban prophecy that could be here sooner than you think. While the costs associated with implementing a smart home have made its viability on the current marketplace uncertain, Verizon Wireless, the nation’s largest mobile provider, has cast its eye towards a loftier prize. Through its Verizon Innovation Program, a subdivision whose mission is to bring wireless connectivity to non-traditional devices, the company is laying an innovative infrastructure for the smart cities of tomorrow. To realize this vision, the Innovation Program offers up Verizon’s wireless powers, state-of-the-art labs and marketing strategists to hundreds of partner companies -- a roster that includes both gadget startups and global leaders in tech. While Verizon’s resources are free to partners, the rationale behind the program is to create more products running on its network. Entrepreneur.com toured the company’s facility in Waltham, Mass., where a staggering array of devices in various stages of readiness is on display. From nascent concepts to market-ready inventions, here are 5 of the most eye-popping things we saw. 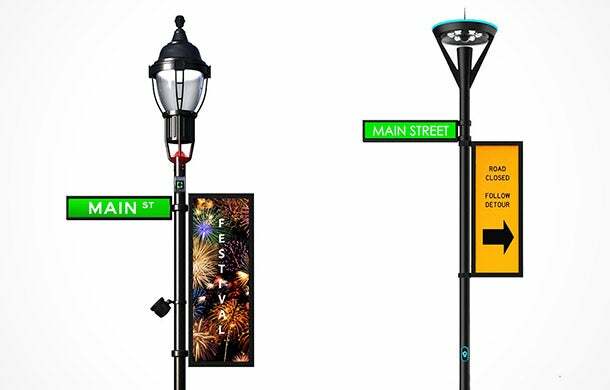 Intellistreets are wirelessly connected lamp posts that can create visual, audio and interactive cues for commuters. Digital screens can be affixed to the motion-sensor light fixtures to showcase ads or direct traffic. Additionally, embedded speakers can play music, broadcast announcements and even serve as emergency call stations for endangered pedestrians. Verizon ultimately envisions that such devices could bring sustainability and orderliness to downtown areas, universities and sporting venues across the country. "Stats say that 30 percent of all the traffic in a city is basically people circling, looking for a parking spot,” says Tim Gorman, associate director of the Verizon Innovation Program. And while some parking app startups have been met with controversy, a company called Streetline is hoping to assist aimless drivers. 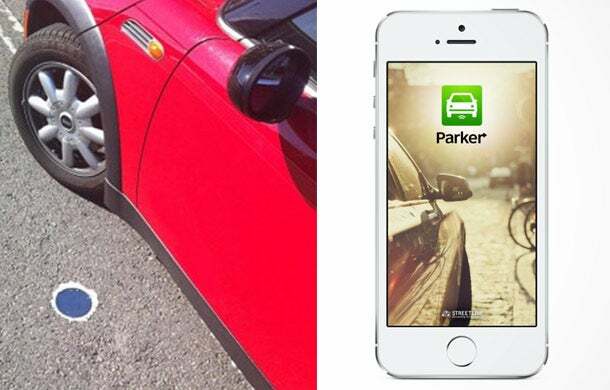 Wireless sensors installed under public parking spaces communicate data that is viewable over the company’s mobile app, Parker. Such a platform could not only aid drivers, Gorman says, but also help parking enforcement officials distribute tickets more optimally. Craig Jackowski, manager of the Verizon Innovation Program, calls VGo one of Verizon’s most emotionally resonant partners yet. 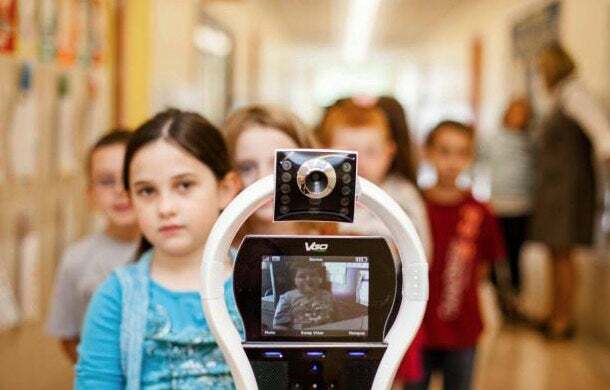 A tall, white robot on wheels, VGo acts as a telepresence, replicating somebody in a distant location and allowing them to talk, hear and move as if they were present. The device could potentially be used by health-care workers to monitor patients, or by students with extended illnesses to attend school without leaving home. Though not many have sold, Jackowski says, the device’s potential uses are particularly poignant. Related: It's a Bird. It's a Plane. No, It's a Flying Car (Finally)! A BigBelly unit in Boston. 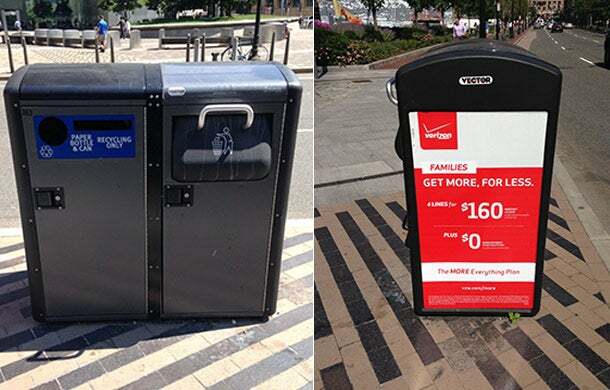 BigBelly public waste stations -- each of which comprises a recycling unit and a solar-powered trash compactor -- can hold up to 180 gallons of waste, or roughly four times that of a normal trash can. Each machine is wirelessly connected to a digital dashboard that alerts collectors as soon as they are primed for pickup. Today, there are tens of thousands of BigBelly stations in the U.S. and 45 countries across the globe, each of which has helped reduce litter, encourage recycling and remove excess garbage trucks off of busy city roads. The HealthID Band and app. 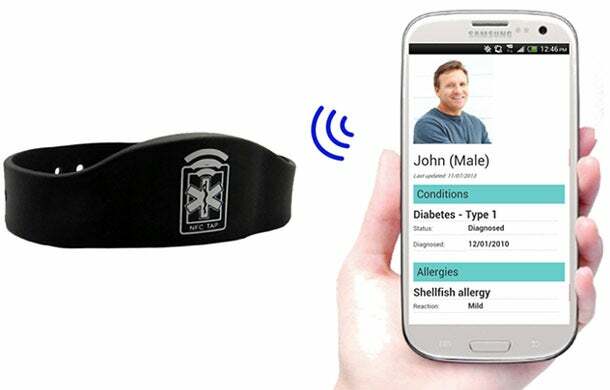 The HealthID Band was born of a father’s concern for his diabetic son -- though the device could ultimately have wide-ranging impacts upon the emergency health-care sector. The bracelets utilize NFC (near-field communication) technology to transmit detailed information about a patient’s medical condition in the event of an emergency. Medical conditions, allergies, medications and emergency contacts are all accessible with the mere tap of a smartphone, streamlining resources for first responders and potentially saving lives. IoT Disruption Has Begun. And Retail Is Just the Start. When Will Your Industry Be Affected? The Future of Business: Where Will We Be by 2020?